The development of the music for this game has gone so well - way better than the development of the gameplay itself, which I'm having serious doubts about! Writing a silly tune was the easiest part. I've now improved that - it has a 'chorus' which is deliberately reminiscent of 'English Country Garden'. 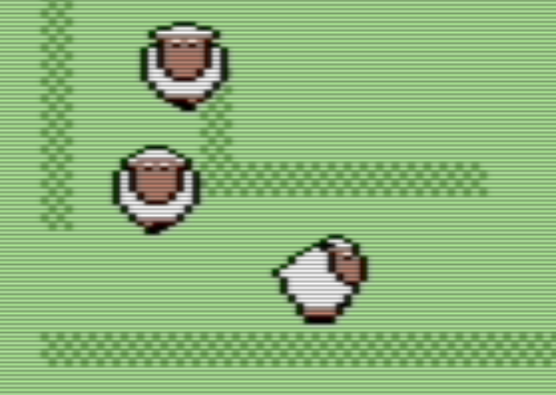 The main part of the tune is meant to accompany sheep trotting / blundering around a field. It even has a fourth part now, although I can only use three because the C64's sound chip - SID - has three tone voices. Disclaimer: Tonight I've been messing around with voices and ASDR envelopes, and haven't yet found settings that I really like. The bass in particular is raspy here, I want a smooth sound, but when I use the triangle waveform it sounds very quiet even with the highest sustain volume. In the first part of this little diary, I mentioned that I started to use Derek Morris' sound library. 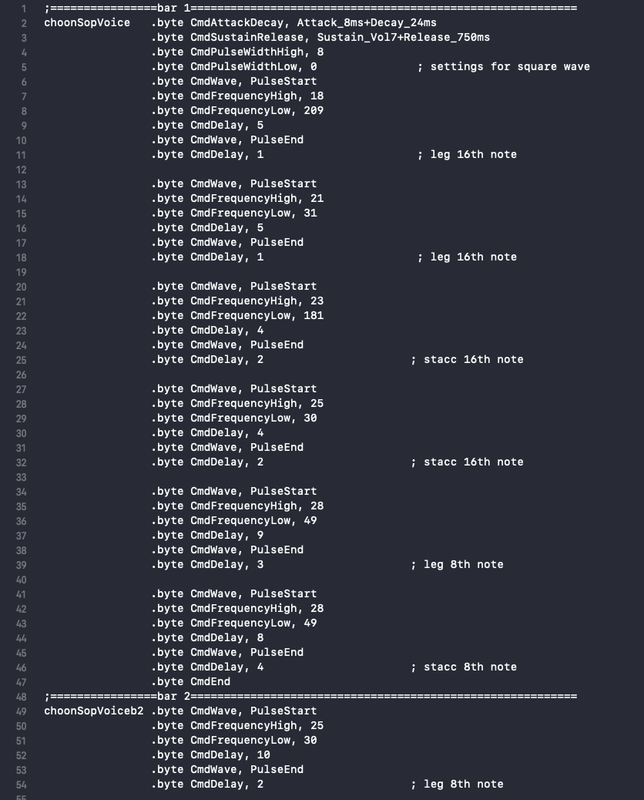 It allowed me to 'code' the tune with his user-friendly constants. It worked with three voices at once but I had trouble with the synchronisation. At first I devised a method of breaking the music down into bars, and having the main program loop kick off each bar of the three voices at the same time. That's why there's a cmdEnd at the end of each bar in the code above. But after manually following the loops in his code around and around as if I were the processor, noting down variable values on paper, I found that the delay loops were delaying for one more cycle than I thought they were. It's to do with counting down to zero. You get one more delay than the number you specify after the CmdDelay. I wouldn't call this a bug, Mr Morris designed this for playing a sound effect on a single voice so this point is insignificant in that context. It took a single 'dec' instruction in the right place, and the soundlib is playing my music perfectly. (although faster than before, so I've had to re-write the delay values in my sound command files so that there are 48 in each bar rather than 32). 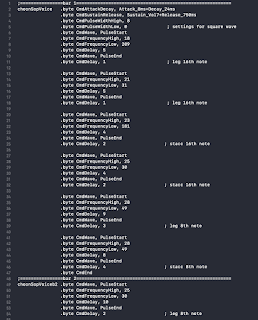 I no longer need my 'bar-by-bar' system to keep everything in sync, because as long as the delay count is the same in each bar, everything will stay in sync. That saves one byte per bar per voice, plus my sync routine and the execution time of that each programme loop. 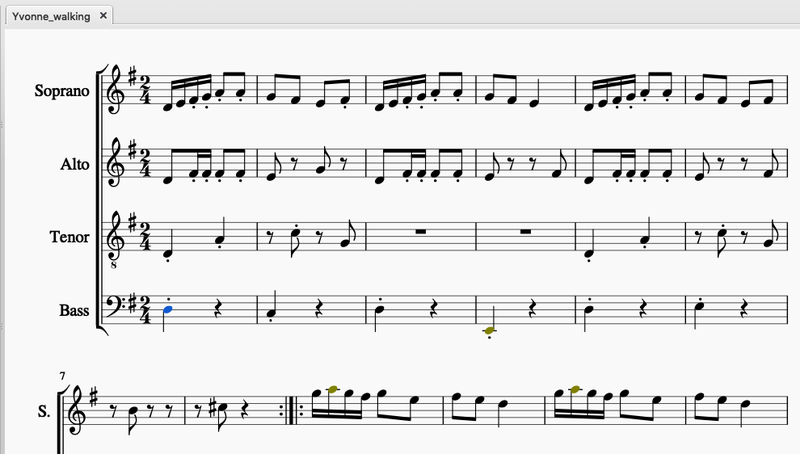 Manually translating the notated music to the sound library instructions is very laborious. Particularly looking up the high and low note values for each note in Appendix E of the Prog Ref Guide (I bought a copy of the C64 one in the end). I'm thinking about how I might write a tool(s) to help with this, because I've really enjoyed the composition part and want to do a lot more. 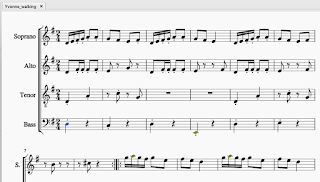 Possibly even a mac app to take the sheet music (as musicXML) and build those sound commands.